You learn something new everyday and you can never be sure from where. Sometimes it is a bit of knowledge that will be key at some important point in your life (e.g. turn in the direction of the skid). Other items helpful but not likely to be life altering (e.g. leaves of three let them be). There's that basic knowledge we use daily (e.g. how to tie your shoes or at what temperature to anneal glass). And then there are things that are just fun to learn. 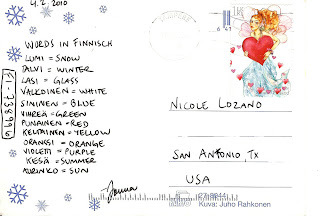 So today when this Hispanic South Texas girl received a postcard from Finland with her own personal language lesson, I smiled and enjoyed what is likely to be the entertaining kind of knowledge. Of course you never know when you might have to explain to a Finish doctor that it is a piece of Punainen Lasi which they can not see inside the cut that is bleeding profusely from your Femoral artery. Best to be prepared just in case. I joke, but sincerely thank you Jonna for sending the perfect list of words for me. 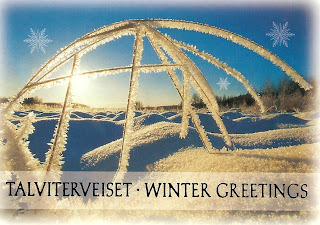 I very much enjoyed the beautiful card that came with it's own personal language lesson.